Striking the right level of challenge in an action game is always tricky. If an experience leads to too much frustration, most players will just move on to something more immediately fulfilling. After all, who has time to sit around being miserable? Conversely, if there’s never any sense of danger then it fails to reach its full potential to truly grab the player. Thunder Lotus Games’ Sundered constantly flirts with being too unforgiving, but some great design kept me coming back for more. 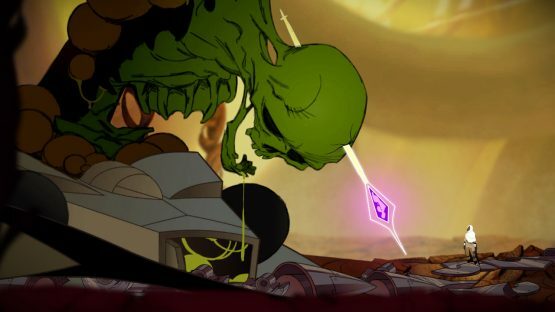 Death in Sundered isn’t some indictment on the player’s skills. It’s presented as an unavoidable reality, and Thunder Lotus Games quickly teaches players that death isn’t something to get upset over. That’s because the player gets a chance to upgrade their skills after every defeat. Everything from making the protagonist’s attacks do more damage to being able to perform extra dodges can be purchased, and this creates a gameplay loop where the player’s odds at success are always improving. I found that individual enemy encounters weren’t to be feared. Eshe, the protagonist, can handle herself in battle as she can dodge out of the way of enemy attacks and her devastating attacks can wipe out most foes in a combination. The real fear begins when the game starts to throw dozens of enemies at the player. It’s easy to get overwhelmed during these seemingly random attacks, and I found that it wasn’t uncommon to go from full health to dead after a few mistakes. Even though I died a lot while playing Sundered, I loved it when a whole horde of foes was thrown at me. 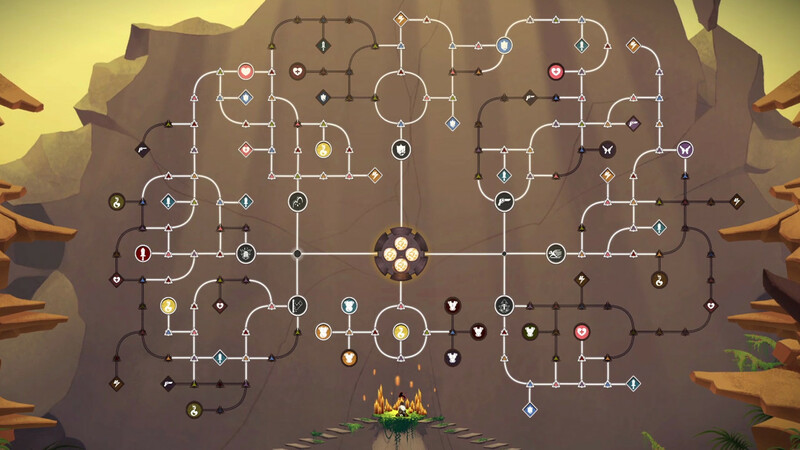 I always looked at it as a test of not only my abilities as a player, but if I had upgraded my character enough to take a real run at the next boss. These encounters are intense affairs, and it all came down to managing my shield, which would regenerate if I could go enough time without taking damage. I had to carefully choose when to attack or to play evasively. It was all about finding a balance, and it resulted in some of the most satisfying combat exchanges I’ve had in a game. Whenever I came out of a huge battle unscathed I knew it was due to my improvements. Improvements come in many forms. On top of the many skills that players can purchase at the altar of death, different perks and abilities can be found from surviving difficult combat sequences and exploring the gorgeous, hand-drawn world. Sundered is very much in the traditional structure of a metroidvania title, and it nails the satisfaction of gaining a new skill that allows the player to get past previously blocked paths. I experienced pure joy when I unlocked a double jump, and was finally able to move around in the environment like I wanted to. There is one sizable difference between Sundered and other titles in the genre, though. There’s an aspect of randomization that ensures that players’ runs will always be slightly different. The core map will always remain the same, but certain rooms will be different in both enemy placement and design. In a game that is all about the will to overcome, I never felt like I was just treading water. I always was having a new experience, and was working my way toward taking on the next boss. Boss fights are where the length of a Sundered playthrough is determined. These are incredibly difficult encounters that requires either mistake-free play or a sizable amount of leveling up. I didn’t find it uncommon to hit a wall against the game’s most challenging creatures, but thankfully by the time I did I had unlocked new abilities that allowed me to explore more of the world. When things got too frustrating, I could just explore other areas, become a much stronger character, and then circle back around. I never felt hopeless in my ongoing battle. So much about Sundered, from its artwork to sound design, is incredible, so it’s disappointing that there is a bevy of technical issues that I ran into. It’s worth noting that a patch is on the way, but since I’m not a soothsayer I can only talk about what the game currently is. There are times when the game will falter under the pressure of its combat and will occasionally hitch up. This is annoying, but it never caused any additional deaths or became truly detrimental to the experience. The game also has some rather lengthy load times, so I’d suggest checking out PlayStation LifeStyle on your phone in-between runs. Finally, I really disliked playing the game with an analog stick as it’s too easy to move backwards when trying to crouch, but the game plays like a dream with the directional pad, so I really can’t complain too much. It’s not a question of if the player will die in Sundered. They will lose the struggle against the Eldritch horrors that call its world home, and it ultimately comes down to the core theme of resist or embrace. Will the player embrace the challenge, or resist it by giving up? That’ll ultimately come down to how much perseverance a person has, but those that do see the adventure out will be rewarded with more glimpses into a gorgeous world and some incredibly tense combat exchanges. Sundered review code provided by publisher. Reviewed on PlayStation 4 Pro. For more information on scoring, please read our Review Policy here.